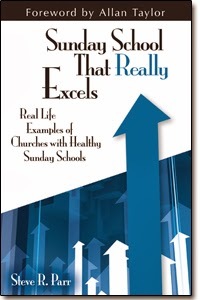 The folks at Kregel recently sent me a copy of Sunday School That Really Excels: Real Life Examples of Churches with Healthy Sunday Schools edited by Steve Parr. I was glad to receive this volume because I am a proponent of Sunday school and have taught in this environment for many years. I have also served on the administrative end of Sunday school ministry. There are a number of things that I like about this book. I like the variety of topics. There are seventeen chapters that deal with appropriate and varied issues. Most readers involved in Sunday school will find something relevant to their situation here. I like that the chapters are relatively short. I like the fact that the chapters are based on real examples. Some books on Sunday school can be long on theory and short on examples. While my assessment of this work is generally positive, I would note a couple of minor criticisms. As with any volume written by multiple authors, some chapters will be better than others. More importantly, given the title of the book, I was a bit surprised that there was not really a definition of what constitutes an excelling or healthy Sunday school. Allan Taylor in the forward mentions the "e" word. He asserts the virtue of pursuing excellence but does not really establish what that means specifically for Sunday school. These criticisms aside, most interested in Sunday school should find something of value in this volume. A 36-page excerpt is available here.